Even the smallest of dents stops your copper pipe from working properly. The dent prevents the liquid from moving effortlessly through the pipe and may result in poor performance. 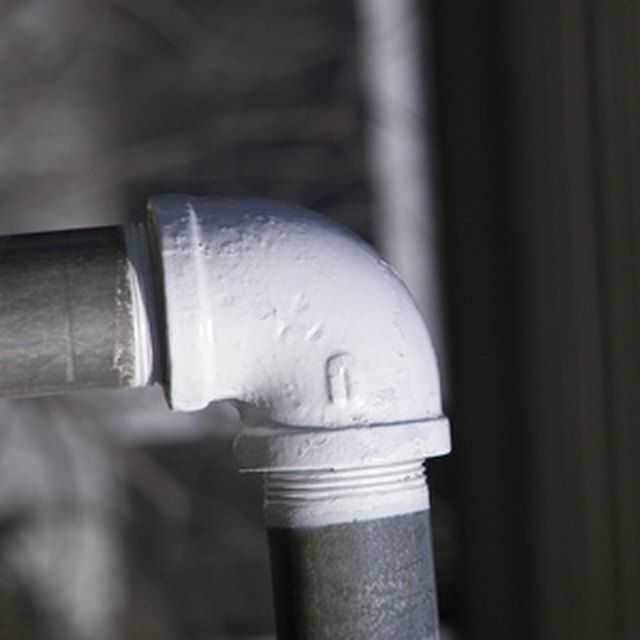 With other types of metal, you simply adjust the area around the pipe or pop the dent out with a plunger. Copper pipes require a little more effort. Remove the dents by pushing pressurized air through the pipe. Heat and pressure remove dents from copper pipes. Pour fresh water down the pipe, flushing out any mineral or gas deposits left in it. Flush the pipe with water at least three times to remove all deposits. Cap one end of the pipe to block it. Insert the air compressor into the open end of the copper pipe. Turn the compressor on and push air through the pipe. Check the gauge on the compressor and keep the psi level at 70 or higher, but below 100 psi. The air compressor pushes dents out of exhaust pipes but may not work as effectively on plumbing pipes. Wear goggles and heavy-duty gloves as you turn a blowtorch on low. Run the blowtorch over the dented area as you gently push and pull on the pipe. Twist the pipe back into its original shape as the blowtorch makes it more flexible. According to William Beall Gray, author of "Plumbing: A Working Manual of American Plumbing Practice," if you keep pulling on the pipe as it heats up, you can gently pull out the dent. Wait until the copper pipe is cool to the touch. Gently run the rotary wire wheel over the repaired area, smoothing the exterior of the pipe and giving it an even appearance. Fine-grit sandpaper works equally well. Paint the exterior of the copper pipe with spray paint designed for metal surfaces, if desired. The paint covers rough areas and marks left behind by the sanding and makes the pipe look new again. For copper plumbing pipes, turn off the water to your house after flushing the pipes but before using the pressure and heat. If you cannot twist the pipe to remove the dents, then try lightly tapping the area around the dent with a hammer. When you push the surrounding pipe up, the pressure pushes out the dent.